Home » an academic » Facts » kids resources » Knowledge » Myths » Science » What is the Biggest Living Organism Here on Earth? What is the Biggest Living Organism Here on Earth? Blue whales (Balaenoptera musculus) are the biggest animals ever to exist on Earth. They can weigh upwards of 150 tons, which is more than the largest dinosaurs! However, the blue whale is not the biggest living thing. That title goes to.... well, it depends on what you mean by "biggest"! The tallest may be a redwood tree (Sequoia sempervirens) nicknamed "Hyperion" in California. At a towering 115M, this giant is taller than the Statue of Liberty (at 95 meter show its 25% taller). The most extensive organism is a very old "humongous fungus" that covers a whopping 2,385 acres in a National Forest in Oregon. At the base of the trees, bunches of "honey mushrooms" (Armillaria solidipes) appear... they are the "fruiting bodies" produced by the fungus, which otherwise lives out of sight. Imagine if apple trees (Malus domestica) grew underground and only the fruit apples were visible to us! That's basically what the fungus does, except that it spreads its "mycelia" not just through the soil. But also through the roots and bark of trees in the forest, attacking them and stealing their nutrients. So, it can continue spreading outwards. However, if we're talking about the good old heaviest organism ever found, that prize goes to a giant panda (Ailuropoda melanoleuca) living high on a Utah plateau. Just kidding... It goes to a single quaking aspen (Populus tremuloides) named "Pando" that weighs over 6,000 tonnes–as much as 40 blue whales. If you go to Fishlake National Forest in Utah, though, you won't see a giant tree trunk–you'll just see a forest of regular-sized trees. 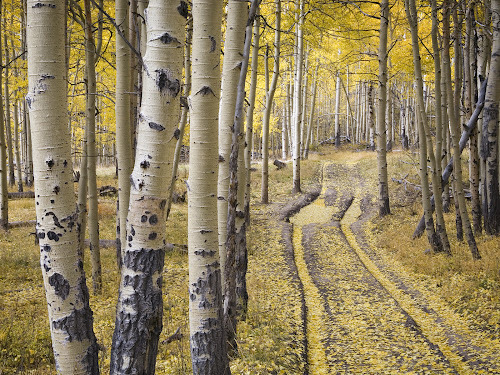 But, thanks to genetic testing, we've learned that this stand of aspen covering 106 acres of land (the size of Vatican City) is actually a single clonal organism that grew from a lone seed long ago. That single tree was able to spread so much because its roots send up shoots that grow into what look like individual trees. Since all 47,000 "trees" are part of the same organism, the forest behaves somewhat unusually. For example, the entire forest transitions simultaneously from winter to spring and uses its vast network of roots to distribute water and nutrients from trees with plenty to trees in need. Speaking of water... if you include water when weighing these giant organisms, then the humongous fungus might actually weigh more than Pando. But foresters, at least, care only about the mass actually produced during growth: the dry mass. And since fungi are mostly water Pando wins. Either way, it's likely that some of the belowground connections, whether roots or mycelia have become severed over time, meaning these giants are probably made up of smaller, but still ginormous and genetically identical, patches. In the End Which is the Biggest? And finally, because of the extensive testing required to confirm "biggest anything" claims, the fungus and aspen can only profess to be the largest living organisms ever found – there may be even bigger monsters lurking right under our feet, just waiting to be discovered! Thank you for reading What is the Biggest Living Organism Here on Earth? posted on the website Kwentology if you want to redistribute this article please include the link as the source. Have some kuwento to share? Contact us!